Within the Financial Services industry the arrangements between custodians of your investments, the providers of the platforms, the uncertainty about where your investments might actually be can often be a murky and 'grey' area for many current investors. They are often in the dark as to where their money actually is, or who has responsibility for its Wellbeing! There are risks associated with every investment, and when it comes to modern day investing we have seen the rise of Counter-Party Risk. Up to about a decade ago not too many people were aware of this risk. Ultimately it is the risk that an entity, which has a liability to an investor, either directly or indirectly, cannot honour that liability, and the investor therefore does not get back what they were owed. If you own a chunk of gold then chances are you know exactly where it is and who has access to it. You are fairly confident that the gold will not go bust, will not spiral to fall in value to zero. The main risk which people who own gold are likely to attempt to minimise is the risk of someone picking it up and running away with it! That concept we can all understand! The confusion and lack of clarity about where it is and if it OK is much less with the likes of gold than it is with a Global Equity ETF bought through an online platform, for instance! Closely linked to the above point, is the fact that gold is a tangible asset. You can pick it up, inspect it, weigh it, and know of it's whereabouts at all times. It requires no contract or complex financial instrument in order to own it. You have direct ownership of it, much in the same way as you would have ownership of a nice watch if that was your thing. Gold has proven itself on many many occassions over the past few hundred years as being a growth asset in times of market uncertainty. For example between 1976 and 1980 the price of an ounce of gold quadrupled from 500dollars to 2,000dollars. Between 1980 and 2000 it fell back down to 400dollars. And then again from when we had the global crisis it peaked at 2,200dollars in 2012, falling since then as market volatility has eased to around the 1,300dollar per ounce mark today. You will observe for yourself that when markets and global equities hit volatility all the crazy people sell their shares (wrong thing to do generally!) and buy gold, which drives the price upwards. Aside from the actual purchase of the gold the costs of maintaining it, relative to its value, should be quite low. With the advent of new EU regulation which forces investment providers to show the true costs they pay for investment funds we commonly see costs (or Reduction in Yield) of up to 3.5% per year. If you have a piece of gold you should be able to have it in safe keeping for a lot less than that! Regulation can be something which offers little benefit and increases costs of doing things but when it comes to investments and provision of assets for investors it should be looked at as a positive. When it comes to buying Gold etc it is not a regulated activity, which ultimately in this case means there is limited protection for the investor/buyer of the asset. It can therefore leave itself open to abuse and potential headaches for investors. That's not to suggest that just because other forms of investing are regulated that they are perfect, but you know where I'm coming from hopefully! The long term return of any asset will vary greatly when you look at performance over different periods. 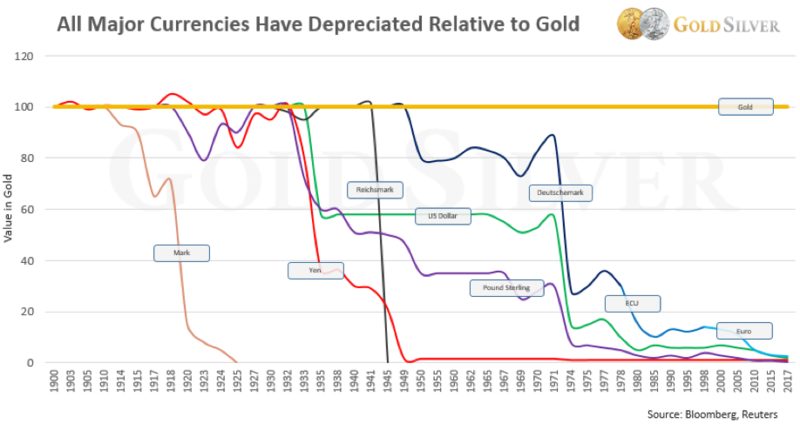 The guys over at A Wealth Of Common Sense did their own calculations to determine the actual real returns of gold over the past 4 decades, and found the rates as per the box below. Real return over the past 48 years of less than 4%. Real return over the past 38 years of minus 1.5%.......all of this leads one to conclude that the returns one can expect to achieve are volatile to say the least, and have lagged Global Equities over most periods. So if you have a gold bar how do you go about selling it?? You don't see too many of them on donedeal.ie and the likes.......so you will most likely sell them back to the brokerage that you bought them from. Trouble with this is that the brokerage will want to make money on the deal. So the same as if you were trading in car, they will offer to pay you less than they will hope to sell it to someone else, in order to make a profit from the activity, which is perfectly fine. What this means is that you may receive only 95-98% of the market value for your gold. If, for instance, you owned a equity portfolio and wanted to sell today, unless there is a brokerage/transaction fee, you will receive 100% of the current value. The price of gold seems to have little correlation to much else (other than it becoming more popular and pricey in times of equity volatility). It is wildly unpredictable in its nature, over the very long term it has delivered little above the rate of inflation, and nobody has any clue as to what it might or might not do in the future long term. So, should I buy Gold as an investment? It is hard to see from all the data if it is a sustainable and value-adding investment asset. Unlike a Global Equity Index there is no long term trend of convincing proportion to instil any real level of positivity about it's future. There are so many varying reports and assertions about it's actual long term growth. In my research I have seen wildly differing reports as to how what it actually did deliver in terms of real return. And that is part of the problem, such a lack of clarity, despite its sheen, as to what this asset has actually done for investors over the long term. Sign Up to our weekly newsletter here....we'd be delighted to have you join the community!